I'm finally home on the Georgia coast and enjoying the beginning of what will be quite a memorable summer. 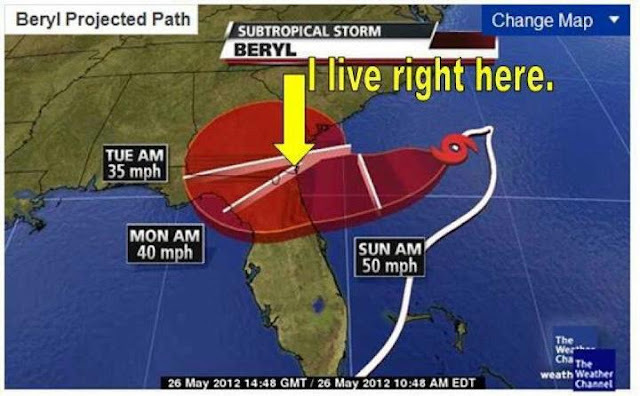 I'm starting off my "vacation" with Tropical Storm Beryl. This is the first storm that has hit my home area head on ever since I can remember. Living on the southeast coast, you would think we get bombarded with hurricanes all the time, but since we live in "the bite," we most always just get the tail ends of storms. We're pretty damn fortunate honestly, but that's not to say we don't get any effects of the yearly hurricane season. Trust me when I say my hometown is always keeping a good eye on the severe weather systems heading in our general direction because hurricanes can change their direction at any moment, and we're constantly getting heavy rain and high speed winds. The cool thing though is that The Weather Channel is on location at my hometown beach! Jim Cantore has been on the island since 7AM today keeping the nation updated on what's going on with Tropical Storm Beryl and the weather conditions in southeast Georgia. After eating breakfast at Sandcastle Café and Grill, which is owned by best friend, Catherine's, parents, my mom, stepdad, and I headed to East Beach hoping to get our 15 minutes of fame. And I did! While they were filming live I walked behind Jim Cantore, and my aunt in Ohio saw me on national television! She called my mom immediately to make sure it was me, and of course it was. I definitely felt like a celebrity. For another 30 minutes my mom and I lingered around The Weather Channel crew and got the opportunity to take pictures and talk with Jim Cantore. (Yes, I got a picture of him. Yes, of course my eyes were closed.) I even got interviewed! But I don't think the interview ever aired on TV, probably because I'm a local, and locals like hurricane season because we get to have hurricane, or in this case tropical storm, parties. But at the end of the day I got interviewed, and I felt mega-famous. On a not-so-meteorological note, these past 48 hours have been pretty laid back and relaxing. I've completed my Maymester course, which has relieved so much stress, and yesterday I spent all day on the beach with Catherine. And it's a good thing I did because I hadn't tanned in two weeks, and I was losing my color. Thankfully I'm back to being dark and very island girl-esque. But I won't be spending the whole of this month on island time because I have to go back to Kennesaw later this week to work with the Atlanta Jayhawks cheerleading team, which I'm so excited about because A.) I love cheerleading, and B.) I'm hoping this will be my job for the rest of the time I'm in college. I told Kelly, the gym owner, that I'd be available to work until the 15th, so I'll probably be going back and forth between here and the city until then. 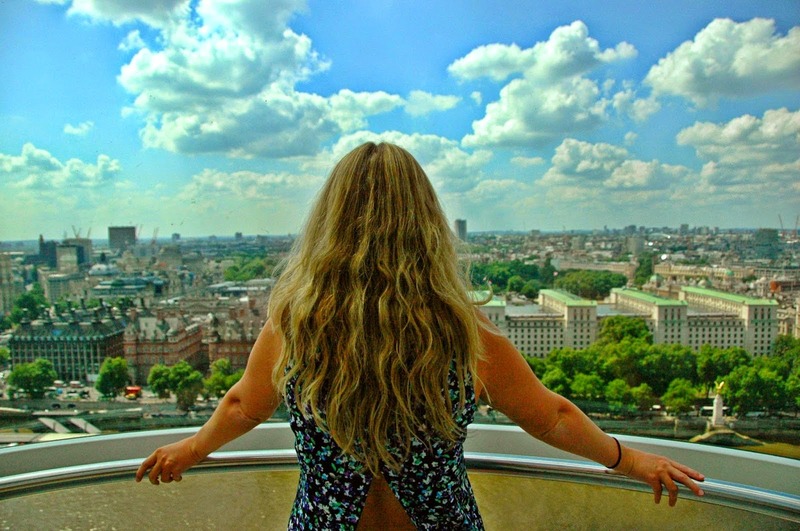 But it feels good to be done with college for the next month and to have nothing to worry about except soaking up the sun and earning some money before going to Germany on the 28th. 32 days!! To wrap this post up I want to go back to Beryl. With every hour the storm is getting closer and closer to making landfall. The sun is pretty much gone, and the wind is blowing at about 30 MPH according to my stepdad. We've also had sporadic rainfall. It's just a tropical storm, so I'm not worried much at all about any significant danger or damage. But like I said, we never have hurricanes hit us head-on like this, so it's pretty exciting to be so centered around this tropical storm. Personally, I can't wait to see how the weather worsens throughout the night and into tomorrow and Tuesday. Cool, right?! Bring it, Beryl!